The Arab Spring: A History is a bi-weekly podcast seeking to explore just how the Arab Spring happened. If you've ever wondered just what has been happening in the Middle East for the last few years, this is the podcast for you. So, how are we going to do this? We're going to tell the story of the Middle East since 1900, and take it up to the present day. We'll look at a mixture of revolutions, social reform, political developments, global diplomacy and economic boom and bust across the region that attracts so much attention from the rest of the world. From Turkey to Egypt, Dubai to Syria, Iran to Israel, Afghanistan to Tunisia, we'll follow how the world of 1900 became the world we live in today. This week we continue in Turkey to cover the events of the 1980s. . . This week we briefly cover the solidification of Khomeini's regime and the succession of Khameni and Rafsanjani. We then move on to cover Turkey in the 1970s as it undergoes a series of coups.. . . This week we recap events in Iran, more specifically the hostages in the American embassy in Tehran. We also introduce Ronald Reagan, and cover the 1980 US Presidential election.. . . This week we examine the aftermath of the Islamic Revolution. Ayatollah Khomeini is now in power, and he is determined to change the world. This involves ending his alliance with the communists, going to war with Iran, and, of course, the infamous capture of the American embassy in Tehran.. . . This week we watch the Shah's regime try to become a regional power before entering its death spiral. Finally the people snap and a year long revolution follows, forcing the Shah out of the country and heralding the return of Ayatollah Khomeini.. . . This week we see how the Shah managed to gain control of the country, and introduce Ayatollah Khomeini into the narrative.. . . This week Mossadeq rises to the top of Iranian politics, and challenges both the Shah, Britain and America, which leads to his downfall in a 1953 coup.. . . This week we return to Iran to look at the build up to the Islamic revolution. We begin by looking at post-occupation Iran and the rise of Mossadeq.. . . This week we focus on the Camp David Accords, the first real attempt to form a peace between Israel and Palestine.. . . This week we turn to Egypt and Syria for the rise of Sadat and Assad, before turning to the Yom Kippur War and the election of US president Jimmy Carter.. . . This week we turn to the Persian Gulf and talk oil. We take Bahrain, Qatar, Kuwait and the United Arab Emirates up to 1979, looking at their independence and how they became the oil states. We also look at the Global financial crisis of the 1970s, Saudi Arabia and the rise of Qaddafi.. . . This week we follow the narrative of Iraq through the 1963 revolutions, the regime of Arif, and the Baathist Revolution of 1968. We then take a look at the rise of Saddam Hussein to become president of Iraq in 1979.. . . The podcast is back! This week we continue to tell the story of Iraq following the July Revolution of 1958. We look at the initial conflict, Qasim's Premiership, and the February 1963 Revolution.. . . This week, for the first time since episode 9, we return to Iraq. We follow the turbulent period after 1939 which Nuri al-Said dominated until the Iraqi Revolution of 1958.. . . This week we take Turkey through the rise of collapse of the Democratic Party, as the economy turns sour and chaos envelops the country. The army is left to hold everything together.. . . This week we return to Turkey. We tell the story of Ismet Inonu and his rise to power along with Ataturk, before seeing what happened after Ataturk's death. We cover the creation of the Democratic Party in 1946 and the important election of 1950.. . . This week we end the story of Nasser. We cover the last decade of his life, looking at the Yemeni Civil War, the Six-Day War, the Cuban Missile Crisis and the creation of the PLO.. . . This week we go from 1956 to 1961 in Egypt and Syria to talk about their political union and the formation of the Baath Party.. . . This week we continue telling the story of Egypt, covering 1956 and the Suez Crisis. Then we also double back yet again to bring ourselves up to speed on events in Jordan and Syria.. . . This week we explore the effect the creation of Israel had on Egypt. Things begin to go down the toilet until a coup by Nasser and the Free Officers. We also talk about the Third World and Soviet relations with the Middle East.. . . This week we explore the effects of World War 2 ending. We see the Egyptian reaction to Attlee and the creation of Israel.. . . 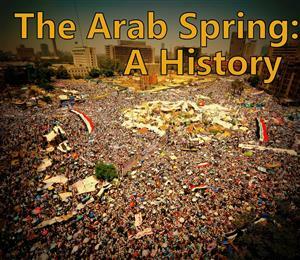 This week in Arab Spring: A History we continue events Egypt. We see how Egyptian independence did not really mark a change, the creation of the Muslim Brotherhood, the early life of Nasser, cover World War Two in Egypt - bringing the whole region up to 1945 - and in the Azerbaijan conflict cover the beginnings of the Cold War.. . . This week in The Arab Spring: A History we continue events Egypt. We continue looking into British occupation of Egypt, the beginnings of the nationalist movement and Egypt's eventual 'independence' in 1922.. . . This week in Arab Spring: A History we turn to Egypt. We look into bringing Egypt up to speed, examining the establishment of the Suez Canal and the accidental British occupation of Egypt.. . . This week in Arab Spring: A History we take the story of Zionism, Transjordan and the British Mandate in Palestine through to 1939, before covering the Second World War in the region.. . . This week in Arab Spring: A History we turn to Zionism. We firstly look at the Mandate in Iraq, seeing how unlikely it was that such a divided state would succeed, before turning our attention to the foundation of Zionism.. . . This week in Arab Spring: A History we turn to the Mandates. We look at just what they were and how they were set up. We take a look out the fall of the Kingdom of Hejaz, the rise of Saudi Arabia, and follow the history of the French Mandates in Lebanon and Syria through to 1939.. . . This week in Arab Spring: A History we finish off looking at Reza Shah. We see how he shot himself in the foot by troubling the Superpowers of Britain, the United States and the Soviet Union. We then turn to how the Great Powers imposed themselves on the west by setting up the situation for the Mandates.. . . This week in Arab Spring: A History we look at revolution. Inspired by Ataturk, Reza Khan rebuilds the Persian State into Iran. A lot of effort given to the army and he tries to make his country more European.. . . This week in Arab Spring: A History we turn to Persia. As bad as things were for the Ottomans, things were worse for the Qajars. We look at the Constitutional Revolution, the weakness of the central government, the weakness of the army, issues with the Majlis, the discovery of oil and Reza Khan's 1921 Coup.. . . This week in Arab Spring: A History we finish looking at Mustafa Kemal Ataturk. We look at how Turkey was created through a mixture of political, social and economic reforms, such as the use of political parties, the Latin alphabet and the 1932 Miss Universe Contest.. . . This week in Arab Spring: A History we cover the rise of Mustafa Kemal Ataturk. We look at his early life, and follow him through World War One and the Turkish Wars of independence. Ataturk may have created a state, but he still needs to create a nation.. . . This week in Arab Spring: A History we cover the Ottoman Empire in the years 1876-1919. We cover the Young Ottomans, the Young Turks, the CUP and, the Armenian Genocide, not to mention the small matter of the First World War. The scene is set for the rise of Ataturk next week.. . .
Hello and welcome to Arab Spring: A History. In this episode we introduce the series, and have an overview of what we will be covering in the coming weeks. The scene is set in 1900, as we explore why the Ottoman Empire and Qajar Persia had fallen so far behind the West.. . .